PASADENA, Calif. -- The closer scientists look at Saturn's small moon Enceladus, the more they find evidence of an active world. The most recent flybys of Enceladus made by NASA's Cassini spacecraft have provided new signs of ongoing changes on and around the moon. The latest high-resolution images of Enceladus show signs that the south polar surface changes over time. Close views of the southern polar region, where jets of water vapor and icy particles spew from vents within the moon's distinctive "tiger stripe" fractures, provide surprising evidence of Earth-like tectonics. They yield new insight into what may be happening within the fractures. The latest data on the plume -- the huge cloud of vapor and particles fed by the jets that extend into space -- show it varies over time and has a far-reaching effect on Saturn's magnetosphere. "Of all the geologic provinces in the Saturn system that Cassini has explored, none has been more thrilling or carries greater implications than the region at the southernmost portion of Enceladus," said Carolyn Porco, Cassini imaging team leader at the Space Science Institute in Boulder, Colo.
A panel of Cassini scientists, including Porco, presented these new findings today in a news briefing at the American Geophysical Union's fall meeting in San Francisco. "Enceladus has Earth-like spreading of the icy crust, but with an exotic difference -- the spreading is almost all in one direction, like a conveyor belt," said panelist Paul Helfenstein, Cassini imaging associate at Cornell University in Ithaca, N.Y. "Asymmetric spreading like this is unusual on Earth and not well understood." 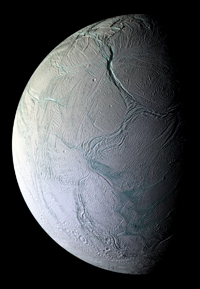 "Enceladus has asymmetric spreading on steroids," Helfenstein added. "We are not certain about the geological mechanisms that control the spreading, but we see patterns of divergence and mountain-building similar to what we see on Earth, which suggests that subsurface heat and convection are involved." The tiger stripes are analogous to the mid-ocean ridges on Earth's seafloor where volcanic material wells up and creates new crust. 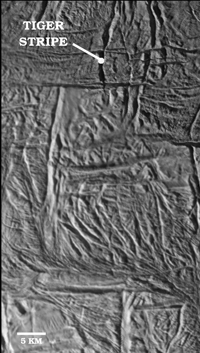 Using Cassini-based digital maps of the south polar region of Enceladus, Helfenstein reconstructed a possible history of the tiger stripes by working backward in time and progressively snipping away older and older sections of the map. Each time he found that the remaining sections fit together like puzzle pieces. Images from recent close Enceladus flybys also have bolstered an idea the Cassini imaging team has that condensation from the jets erupting from the surface may create ice plugs that close off old vents and force new vents to open. The opening and clogging of vents also corresponds with measurements indicating the plume varies from month to month and year to year. "We see no obvious distinguishing markings on the surface in the immediate vicinity of each jet source, which suggests that the vents may open and close and thus migrate up and down the fractures over time," Porco said. "Over time, the particles that rain down onto the surface from the jets may form a continuous blanket of snow along a fracture." Enceladus' output of ice and vapor dramatically impacts the entire Saturnian system by supplying the ring system with fresh material and loading ionized gas from water vapor into Saturn's magnetosphere. "The ions added to the magnetosphere are spun up from Enceladus' orbital speed to the rotational speed of Saturn," said Cassini magnetometer science team member Christopher Russell of the University of California, Los Angeles. "The more material is added by the plume, the harder this is for Saturn to do, and the longer it takes to accelerate the new material." With water vapor, organic compounds and excess heat emerging from Enceladus' south polar terrain, scientists are intrigued by the possibility of a liquid-water-rich habitable zone beneath the moon's south pole. Cassini's flybys on Aug. 11 and Oct. 31 of this year targeted Enceladus' fractured southern region. An Oct. 9 flyby took the spacecraft deep into the plume of water vapor and ice shooting out of the moon's vents. Cassini's next flyby of Enceladus will be in November 2009. For more information about the Cassini-Huygens mission, visit: http://ciclops.org, http://www.nasa.gov/cassini and http://saturn.jpl.nasa.gov.